When a man feels like you’re always disappointed in him, that can cause a LOT of damage in the relationship. When a man starts to feel like he can never make you happy, he’ll usually “shut down” or start to withdraw. I’ve seen this happen over and over again. The “4 Rules” are extremely important for success in any relationship. If you’re not familiar with them, you’ll want to take a look at Rori Raye’s eBook, “Have The Relationship You Want” (you’ll find an explanation and specific examples of each of the “4 Rules” there – this is an amazing eBook that I highly recommend!). 1. Don’t try to control a man. 2. Don’t try to control the outcome. 4. Learn to take no for an answer. If you’re forgetting the “4 Rules” – you’re going to be trying to control your man or the situation by suggesting things to him, asking him questions in a passive/aggressive way, criticizing him, or judging him. Even if you’re doing this in very subtle ways, he’ll be able to feel it. Men are very sensitive to the vibe we give off – so he can feel the undercurrent of disappointment or anger, even if you’re very carefully trying to not come across that way. When you’re feeling disappointed with a man, blaming him or making him wrong will push him even further away. We’ve all experienced this. You can’t convince a man that you really love and respect him by TALKING about it – it’s your actions that are meaningful to him, just like his actions are meaningful to you. He can say “I love you” all day long – but unless he calls you, touches you, shows affection, and smiles at you – you’re not going to FEEL loved, right? Well, a man needs different things than you need in order to feel loved. A man needs RESPECT. This doesn’t mean you should tolerate bad behavior – but when a man is doing the best he can to try and make you happy – you want remember to show appreciation. A man needs to be able to feel MASCULINE in a relationship. 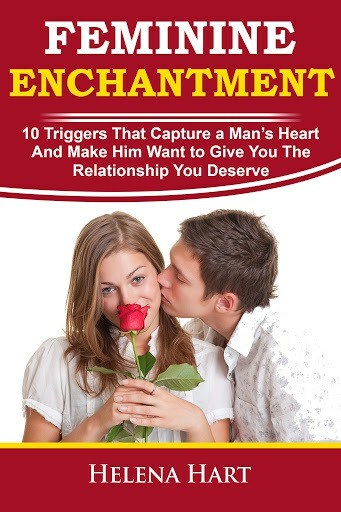 He needs to really feel that he can fulfill you in a romantic, masculine way. When you let go of expectations and stop trying to control the situation – and allow yourself to lean back and be surprised – you’ll start to become more aware of all the wonderful things he DOES do to show his love and make you happy! 1 Response to "When A Man Feels He Can't Make You Happy"
Nice finding your blog, I have gained a lot from it!